Saint Julie's High School in Liverpool envisioned the idea of passing on the legacy that St Julie left us as the 'Passing on of the Baton'. 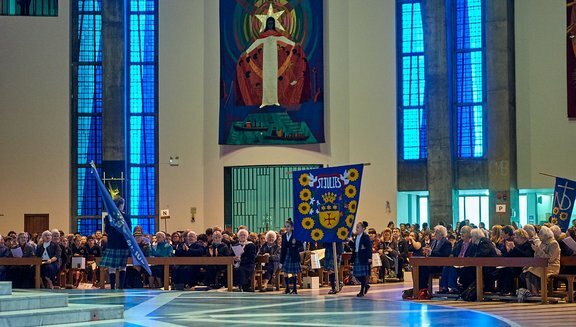 Notre Dame Catholic College and St Julie's High School came to a joint decision on how to commemorate the passing on of Julie's legacy, and organised a baton relay around England and Scotland, visiting all Notre Dame Schools on the way! 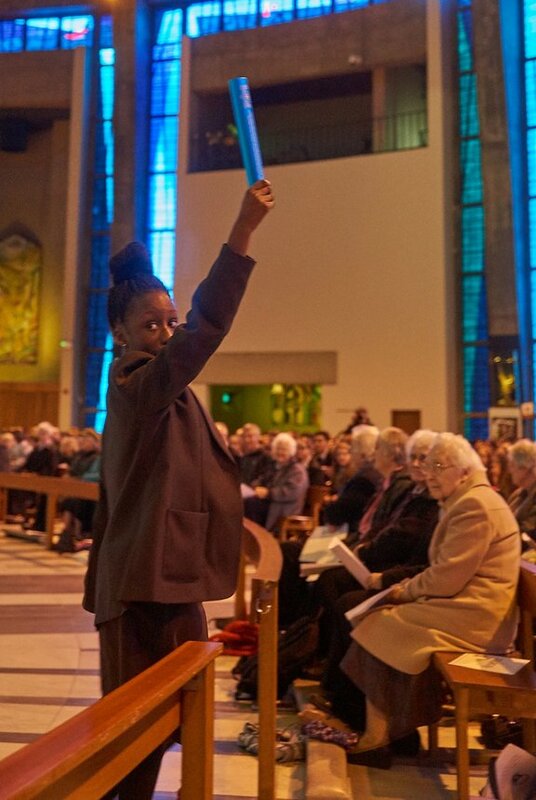 The Baton was taken to the Cathedral on the 30th March to commemorate the anniversary of St Julie's death two hundred years ago on April 8th. This year was designated 'The Year of Saint Julie'. The special Baton was created to focus on Julie's message and her ideals so that her spirit could live on, and through all who were associated with Notre Dame schools. Like any good idea, the Passing on of the Baton had a life of its own! It could not be contained only in Liverpool. 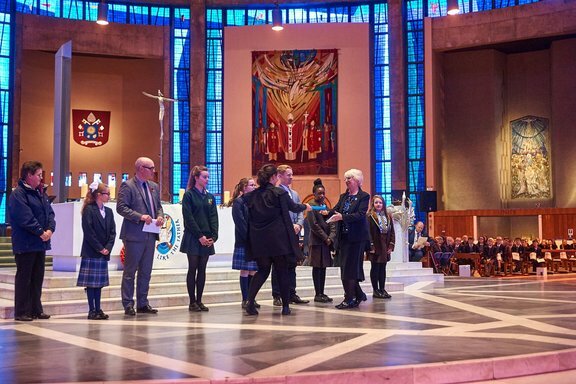 St Julie's school took a coachload of pupils and staff to Notre Dame, Sheffield, where they handed this Year of St Julie Baton on. Notre Dame Sheffield then went to Notre Dame Norwich who passed it on to Notre Dame Southwark. Then it was handed on to Notre Dame Plymouth who in turn passed it on to Notre Dame Glasgow before arriving at Our Lady and St Patrick, Dumbarton. The Baton left left Liverpool in March 2016 and on Monday, 14 November 2016 the Baton arrived back in Liverpool to be passed on to Sister Margaret Walsh, the Coordinator of the Heritage Centre in Namur, Belgium, where it will remain. 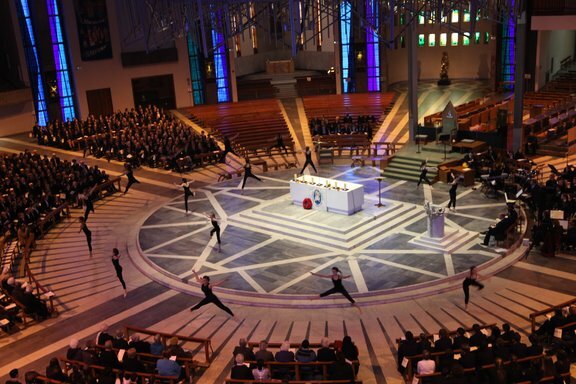 Notre Dame Catholic College hosted the joyful event in the Cathedral which brought together dance, drama, music and prayers. The event was attended by representatives of ALL the Notre Dame Seconary schools in the country. Many of theSisters from local Notre Dame communities and a Sister from Glasgow were there to appreciate how through the students, St Julie's spirit is alive and well today! "We will follow her way - and her story tell! With liberty of spirit we will serve the good God well". We were welcomed to the Celebration by Mrs Frances Harrison, Executive Headteacher of Notre Dame Catholic College. The students from the College then gave a drama performance of the life of St Julie, accompanied by the College Orchestra. 'Ah, qu'il est bon le bon Dieu' and the school's motto for the Year of St Julie: 'Do small things with great love' . The Parade of Flags representing all the countries in the world where Notre Dame Sisters minister today was a colourful and spectacular display. A video message from Sister Teresita, the Leader of our Congregational Leadership Team was replayed on two large screens on either side of the Cathedral. Sister Teresita welcomed us to this joyful festivity and spoke of how St Julie was the first to pass on the Baton to her Sisters. Her vision and dream was tht children especially girls, would be educated by the Sisters. Sister Teresita thanked us for passing on the Baton and said that now we are called to work, and through our lives, improve the lives of other people by Communication and Relationship. After Sister Teresita's message each school brought up its own banner. Again. this was a very beautiful and colourful display. 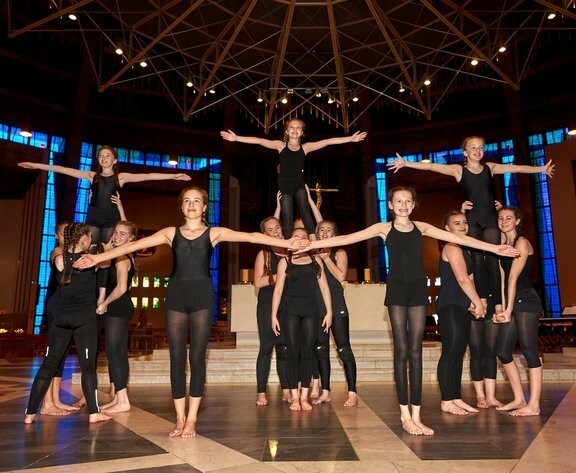 The dance performance led by students from St Julie's and Notre Dame College portrayed the life of St Julie. It was an awesome moment to see the students who were balancing up high, supported by other students. In the closed up photo you can see the joy on the faces of the youngsters. The two big screens were used again as Sisters introduced themselves and told us the dates of when they took up the Baton and become Sisters of Notre Dame. The Baton was then presented to Sr Margaret Walsh. It will now continue its journey to the Heritage Centre in Namur. Who knows where it will be passed on to next; Africa; America; Japan; - or any of the world wide places where Sisters of Notre Dame are working? Sr Pat Ellen then invited us to make our responses to the following promises. It was impressive to hear the strength and power of the "I will" to each of the promises. Mrs Frances Harrison. I was fortunate to have a student right in front of me to keep up with all the actions. When I got mixed up, we both enjoyed it all the more!